Do you know what typewriter this is? 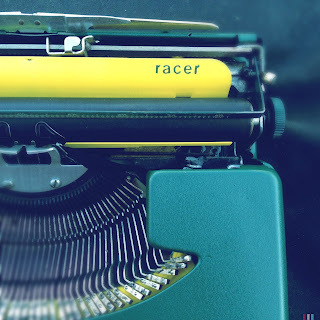 Racer? No, it's a Smith-Corona Skyriter, 2Y series. 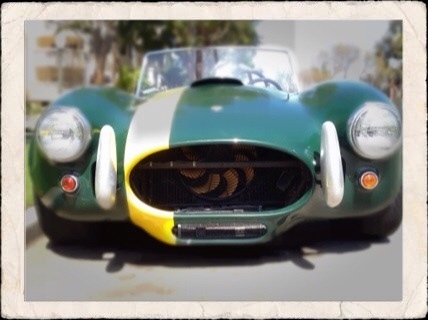 It's was my last few weekend's restoration, or perhaps more accurately, revival project. I was toying around with my two different Skyriter models (in the dueling skyriters blog) and thought it necessary to get the third and earliest Skyriter model, the 2Y, to complete the comparison. So out of curiosity, I looked on Craigslist and found one available. I quickly contacted the seller, made an offer and he accepted. The only catch was he was 60 miles away. I decided it was not a problem and headed over that evening after waiting out Los Angeles rush hour traffic. Now is that an obsession or what? Of course, I didn't really think about it too clearly and after I got there, realized I also had to get back. Two hours and 120 miles. It didn't seem as good of an idea anymore, but like a junkie's addiction, I didn't see that far ahead. I found the address and the man greeted me at his driveway after a few lost phone calls. He had the typewriter out ready for me. I took a look. It was in bad shape but I knew it would be. In the ad, it said it needed TLC, but it also said it worked but it didn't. Not really. A few letters I struck didn't reach the platen. I already knew from my first glance the handle was broken and three rubber feet were missing. Did it really matter if it worked or not at this point? 120 miles, empty handed? I think not. I paid the man and got going. There was no point staying or haggling. I knew in the back of my mind when I contacted the seller that this could be a parts machine. I found myself a nearby In and Out Burger and had myself a late dinner before jumping back on the highway. By this point, it was late late in the evening. I would make it back home before midnight. I should've went straight to bed when I got home, but of course, I didn't. I had to check out the machine more closely. It was one dirty grimy machine. In fact, when I first put it in the car it stank like smoke. I had to stop a few blocks later and remove it from the backseat and put it in the trunk. It was by far the grimiest machine I ever brought home. Oil and grease plastered everything. I never understood why anyone would want their typewriter this way. The internals seemed like they were soaked or sprayed entirely with oil. The machine seemed like it was dripping, but it wasn't because the oil and grease had frozen mid-drip and caked up, forming dropping-like crude all over the bottom and structural skeleton. I struck a few more keys and discovered it was only the left side that didn't strike the platen. It was being obstructed by a metallic arm of some sort. Luckily, I traced the problem to an unhooked spring behind the type bars which pulled this arm back away. It was an easy fix without taking anything apart. So three missing rubber feet, a few dents in the case, a broken handle and a major cleaning. Not bad I thought. I could work with that I guess since I had gained a little confidence with semi-repairing my Underwood. With some experience with my two Skyriters before and a working guide, I easily unscrewed the two screws to take it apart. Everything was fine still until I pulled out the internal skeleton. The felt lying at the bottom was disgusting! Half a century of grease and oil and who knows what else. It was still moist and held a noisome odor. I had to put the machine down and called it a night. Tomorrow, I decided, I would need to give it a major soap bath. I didn't get to it the next day, and a few days later, I gave it the promised soap bath. It had worked well when I gave it to the Underwood Golden Touch. Cleaned it right up. But it the mean time, my mind was wondering what I could do with the felt. I knew it had to go. During one of my walks, I spotted a Alfa Romeo convertible parked street-side in my neighborhood. I had to take it's picture, it was too pretty. Forest green with an off-center yellow racing stripe! As I was photographing it, I saw the yellow fan behind the grill and then it came to me. Why not custom paint the Skyriter like this car. A yellow felt underneath would pop out the green keyboard. That became the plan. After the soap bath with some rigid scrubbing all around, I let it dry overnight. When I came back the next morning, to my horror, all the type bars were stuck frozen. I forced the bars forward and realized it had all rusted over. I guess they call it flash rust. I didn't notice any rust in prior inspection, but now there were spots all around. Maybe I shouldn't have given such an old machine a soap bath. Now I need to use the bath sparingly and with more prudence. I went to the hardware store and bought rust remover. I brushed it on and rinsed according to instructions. Some of the rust went away but now I was getting sticky keys on more than a handful of type bars. I thought I ruined this one. I didn't really test this machine with paper and ink so I never knew if it worked properly, but one thing I did not want, was to ruin a working machine. I was a little upset with myself but I tried my best to resuscitate it. I rinsed off the rust removal and waited another day. Rust came back. I repeated. I believed I had to wait a full day to let all the hidden moisture evaporate. So days started passing. At this time, I started gathering material for the cosmetic surgery. I made my first ever trip to Michael's. I had no idea craft stores could be so big. I collected the yellow felt and two cans of spray paint. 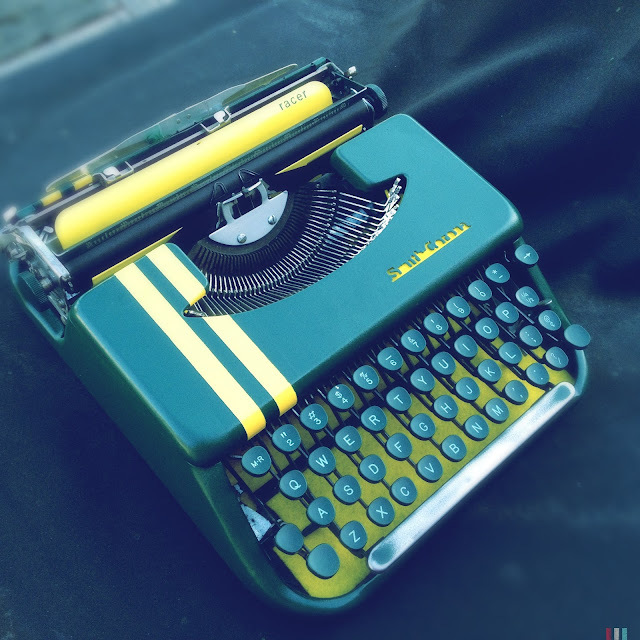 I knew the yellow felt would be impractical for a typewriter, but I had to see how it would look. I wanted to replicate the yellow fan behind the grill detail of the convertible. I began disassembling parts that would need to be painted. I choice to use the stencil method of spray painting so I had to strategy what colors needed to be applied first and masked. While doing this, I realized I was missing the upper back panel which was also it's name plate - the green plate that says "Skyriter." A which point I decided why not try to stencil letters in also. I came up with the simpler "racer" to test. I was also always a big fan of Le Mans racing stripes and I preferred the double thin off centered ones so I changed that. As I banged out the dents in the case and sanded down chipped areas and the space bar, it occurred to me that I should probably wear a mask. Given the dates of these machines, they probably used lead paint. I didn't have one and didn't want to stop, so I didn't. Finally, the rust no longer appeared and I no longer wanted to apply and rinse for fear of triggering more of it. I gave it a little oil to the type bars and it seemed to help. So I gave it some more. More strikers didn't stick. I read online this is one thing you shouldn't do, but what do you do when it's the only thing working? I let it sit, hoping some of the oil would evaporate, but it didn't. I could see the oil turn brown in time, dissolving, I assume, the rust inside. I kept wiping off what I could, hoping I'd get all the excess, but days passed before I finally gave up. It seems like this machine was made or meant to be dripping. At least now I've contained it to one place. 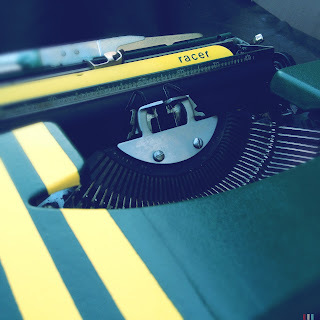 The typewriter was back typing and ultimately, that's what I want. I do fear that one day it will conk out on me in the future due to this application, but for now, hooray for the sweating type bars. Spray painting proved harder than I thought. The half-size yellow can was causing me all sorts of problems. Crinkle paint didn't cooperate well either. I didn't have as much a problem with the regular size green can though. I suspect the smaller can had less pressure or throw to the spray so I couldn't cover as much area as I would like. If I sprayed too close or if there was a recess, paint would gather in little pools, creating uneven patches or losing the crinkle altogether. I didn't have a brush handy to try to even it (but I would later discover it wouldn't have worked anyhow). On certain patches I would try recreating the crinkle, but that just made things worse. I had never used spray paint before and quickly discovered it did not work like oil or acrylic artist or house paints. That's my biggest complaint of the paint job, it's uneven and patchy. If I had my chance to do over, I'd hand paint the stripes over rather than have it sprayed as an under-paint. 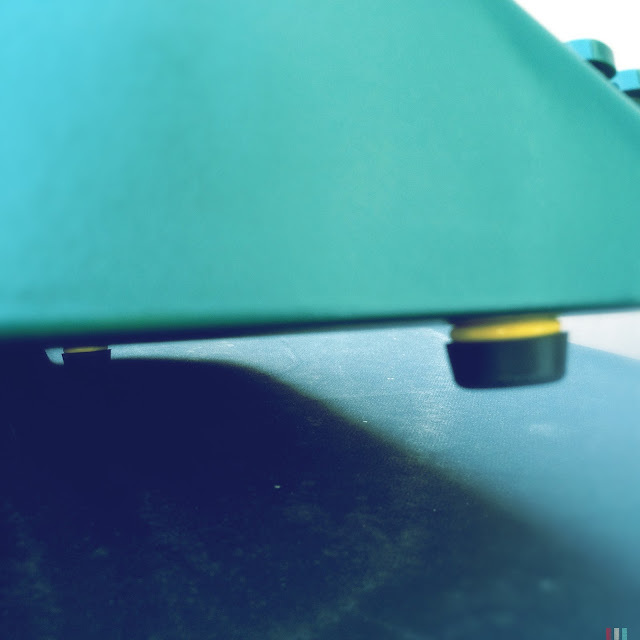 Of this process, the most rewarding part was finding rubber feet substitutes. I made a couple trips to the hardware store and Home Depot and discovered grommets and bushings. I had no idea they even existed before I visited this section. I bought a few sizes and they worked out. The grommets were perfect from the inside, but they worked more like protecters because they were a millimeter or so thin. I eventually chose to use the bushings because they were more like feet. However, there was about a millimeter gap as you'll see in the photo. I chose to use a rubber washer in between to fill the gap and stop the wobbliness without it. I painted it yellow for kicks. When I put the whole thing back together I discovered the bunny ear paper holder was bent out of shape, probably from sitting in it's case for so long without the upper panel. That was an easy re-bend. Overall, I liked the concept and effort, but I think I could've done a better paint job. Maybe stripping all the crinkle away to a smooth surface would've helped. I still need to do some touch-up and clean ups. The space bar and ruler I left unpainted for now. The Smith-Corona logo needs a redo (not pictured). I need to sand away more rust on certain areas. I still need to figure out something for the handle. And mechanically there are still some issues with it. Alignment is not great, caps aren't imprinting clearly and it likely needs a new platen. So there's still plenty of work to do, but I'll let it stand as it for a bit. I need the break. This is how she types. On the flip side, this project has kept me occupied for a few weeks and lessened my typewriter hunting and ebay trolling. The addiction is taking on new forms! Yellow! Racing! Stripes! Pure Awesomeness! 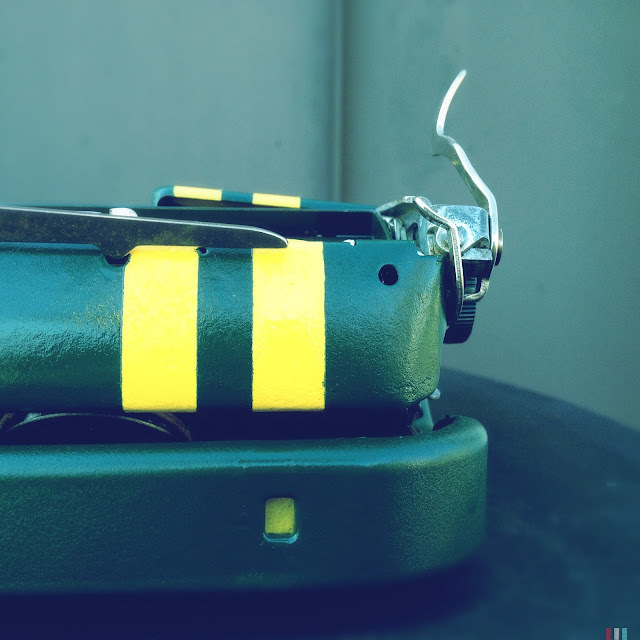 This is one lucky little typewriter, and you are one obsessed typebarhead! I was smiling as I read this because I recognized so much: the long drive to get a questionable typewriter, visits to Michaels and Home Depot, trying out various techniques, ignoring safety precautions ... good thing there is the Internet so we insane people can have company. I use it for bikecasts. I think yours looks really great, and it's a wonderful concept. I haven't tried any stenciling, myself. To avoid new rust formation, use a blow dryer. After blow drying, I also let the typewriter sit over a heating vent and crank up the heat. Then you invariably have to lube the carriage rails and possibly some linkages. I'd suggest squirting some carburetor cleaner into your segment to clear out the oil before it gets gummy. But be careful, carb cleaner will damage paint. yes, the typosphere has not made me seem THAT insane! BTW, how does one get on the Typosphere Blog news feed? I did not see that until now. We need to take your hot rod and my racer for a drag race! Good tip on Evapo-Rust, because the one I got isn't very good. I may have to invest in a blow dryer eventually. And yes, I will need to clean that segment with carburetor cleaner. All great tips. Do you mind if I email you for advice when and if I get to the Lexicon 80? I don't want to screw that one up. Of course, feel free to e-mail me. And I've alerted Mike Clemens to add you to the blogroll on Typosphere.net. This gives me hope that maybe - just maybe - I can make that boring Brother I have look not only new again, but awesome! Great job! Do it, do it! I want to see it!! and thx. Le Mans striping FTW. Sounds like this machine was limping towards the scrap heap when you intervened. I've become a believer in using Naptha to de-grease and de-gunk parts (see the recent post on Clickthing about the big Royal HH) It's sold in hardware stores as lighter fluid, so you'll want to use it out-of-doors and away from open flames, obviously. Love, love, love the yellow felt. I'm a firm believer in snazzy soundproofing, too. 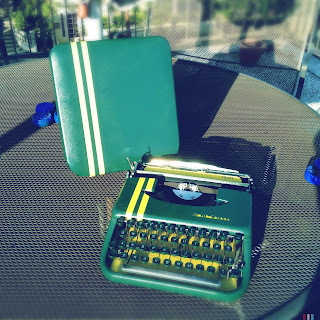 I've re-lined a couple of typewriters in red felt and one in a deep kelly green. Grey and brown are too boring! And thx for putting me on the blogroll!! 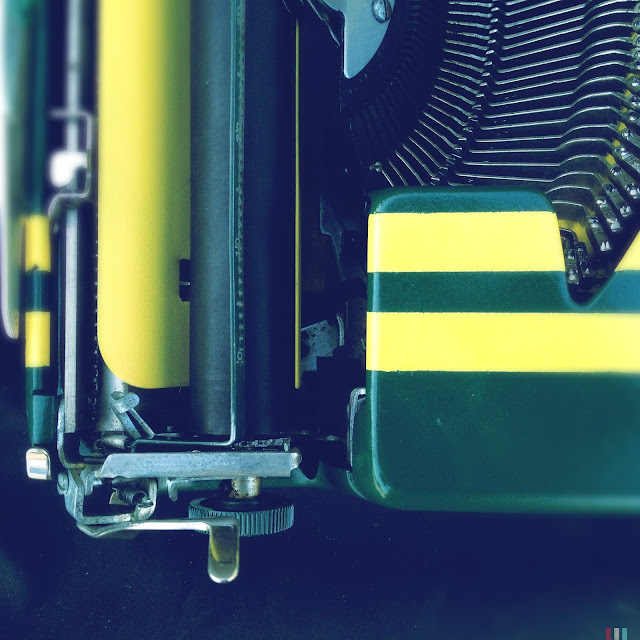 You're now on the Typosphere blogroll, thanks to Mike. Thx to both you gentlemen! That really is a fantastic pimping job. Well done. What an adventure in restoration! It reminds me a little of my recent experience with an Underwood, except that your Skyriter needed more extensive attention. The racing stripes are a nice touch! I've found that kerosene works excellently for freeing up keys. It's also a mild lubricant. The smell goes away quickly. I'm not sure how it would serve as a rust remover, though. Alfa Romeo? Ah, no. 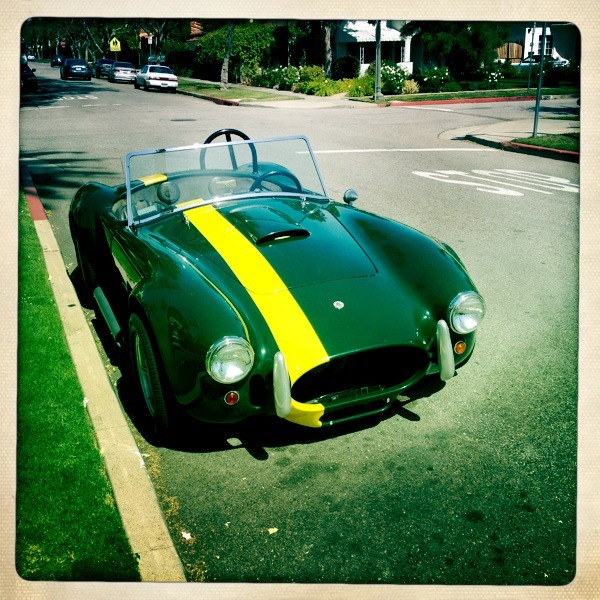 That is an AC Cobra. Either an original or replica. Shelby developed them....ya, I am old car guy. Frankly it is not very important to me but thought I would let you know. I have a SC 4S. Speedline. Awesome little typer. 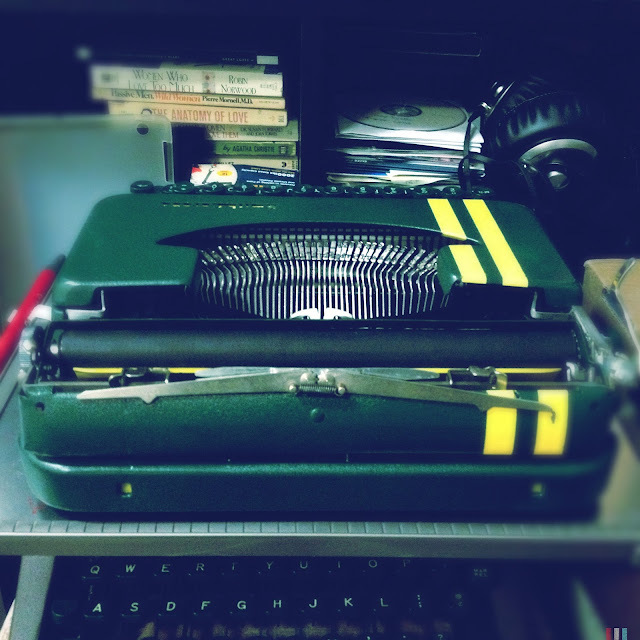 Just spent a day fixing up an Olivetti Lettera 22. Fun little thing. I got used to the feel. Now I am thinking about getting a Skyriter. Are they better than a L22? Almost as good a typer as a Speedline? Guess I need to find a 2Y or 3Y to play with. I don't think the L22 is better than skyriters but I cant really type on the L22's thin space bar so the skyriter fits me better. But the L22 feels more solid. I loved this post a year ago (nearly), but even more so now. I just brought home a Skyriter that seems to be in exactly the same condition yours was in before this wonderful transformation. I shall definitely be using this post as a reference as I try to refurb this poor neglected little fella.